I have depression. I’m sure you already knew that if you’ve read some of my other blog posts. I am, however, very high functioning for someone who has this illness. I am very grateful that I am able to function so well despite my depression, but there are a lot of downsides to it as well. Being high functioning means not being taken seriously when you open up about your depression, it means being questioned about the legitimacy/severity of your condition, it means feeling like a phony for acting like everything is okay when all you want to do is burst into tears and scream. 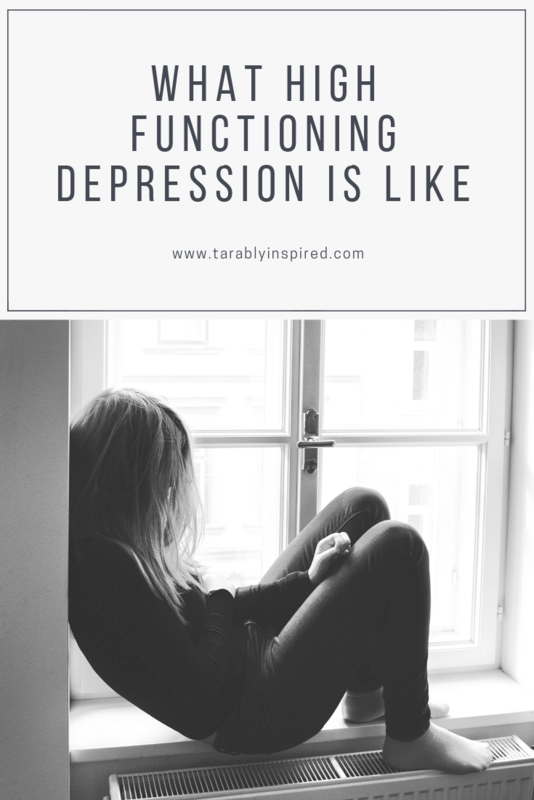 Functioning well makes you feel like you don’t need help, and makes you feel like you’re being selfish/dramatic because there are people with a much harder struggle. Even though we all know that mental illness doesn’t discriminate, it seems that most people have an unconscious idea of what a depressed person looks like. This person we picture cannot get out of bed in the morning, constantly thinks about suicide, can’t stay in school or at a job, and generally seems like a sad person. These depressed people exist of course, but they aren’t the only ones who have depression and aren’t the only ones who need to be taken seriously. But, because of this widespread idea, some people might not be able to admit that they have depression, they might not even believe it. Being able to function well makes it hard for you and others to recognize the signs that you might have depression. A high functioning person may believe that because they do so well, they will be able to “handle” the depression. They think since they are doing just fine with life, their depression isn’t bad enough to seek treatment and they can just will themselves out of it. This is very problematic because it can get worse, and can turn into major depressive disorder, and cause you to no longer be able to function. Another severe risk of not taking your dysthymia seriously is that you may think that self-medicating will be enough to deal with it. This can lead to addiction and alcoholism. This is part of the reason I have never been a big drinker. I feel it when I am drinking, how much better I feel while under the influence. But I know in the long run this is damaging, and not actually fixing the problem, but boy is it tempting to do, just for the instant relief. So next time someone opens up to you about their struggles, or you are worried about someone you think may have depression. Don’t brush it off being they appear to be thriving. I was a great student, but if I got a 79% on a test, I would feel horrible for not getting an 80%. Whenever a teacher made a suggestion about how I could do something different on a project, I would silently beat myself up and question whether anything I did on the project was good. I am a good employee. I only call in sick if I am really very physically sick. I’ve never taken a mental health day because I don’t feel like my depression is severe enough. I dress in nice tidy clothing and do my hair. I am only late when the public transit has delays, and I speak to our clients with a smile on my face. But what no one sees is how hard I have to push myself every morning to get up and get ready to go. I will sometimes stay in bed until I only have 10 minutes to get ready. While speaking to clients, the back of my mind will be going over everything that I’ve done that day that I did wrong or replaying situations with past horrible clients. I am a good wife/friend/family member. I like spending time with the special people in my life, I listen to them and ask them about their days. But sometimes when I am smiling and laughing with them, I am thinking about something that happened 10 years ago that I am upset about still for some reason. I will have intrusive thoughts that tell me they wouldn’t miss me if I died, they don’t care that I am there now, and they would prefer if I left because I am annoying them. One of the reasons I try to be open about my mental illness is to help fight the stigma about mental illness, but also to show people that a functioning person who seems to have it all can and does struggle. I function just fine, but I still take my medication, exercise, and use my coping strategies to help keep me that way. Don’t overlook your depression, no matter how mild you think it is. Get the help you need, you are worth it. Yes My Husband Plays Video Games, No It Doesn’t Bother Me. Why Would It?